If you've been reading SIL for a while, you'd know that we're kinda cookie mad - especially Jesse. 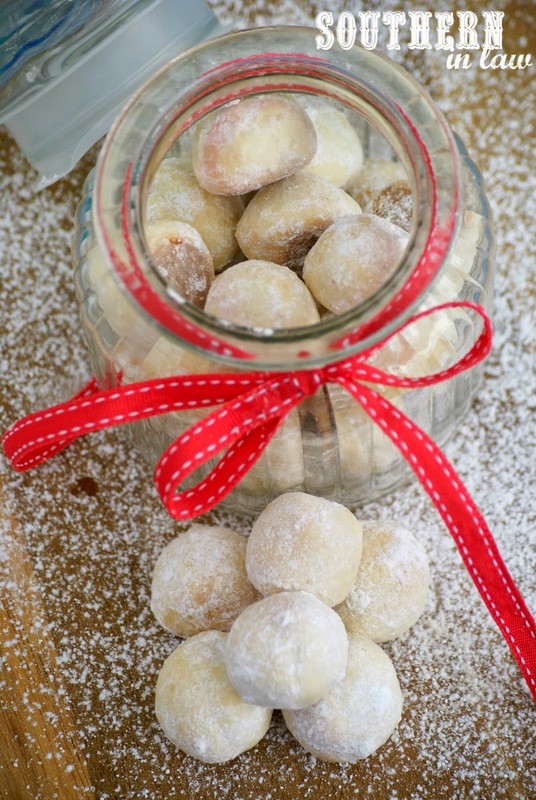 But whilst we love regular cookies, Christmas cookies are a million and one times better! 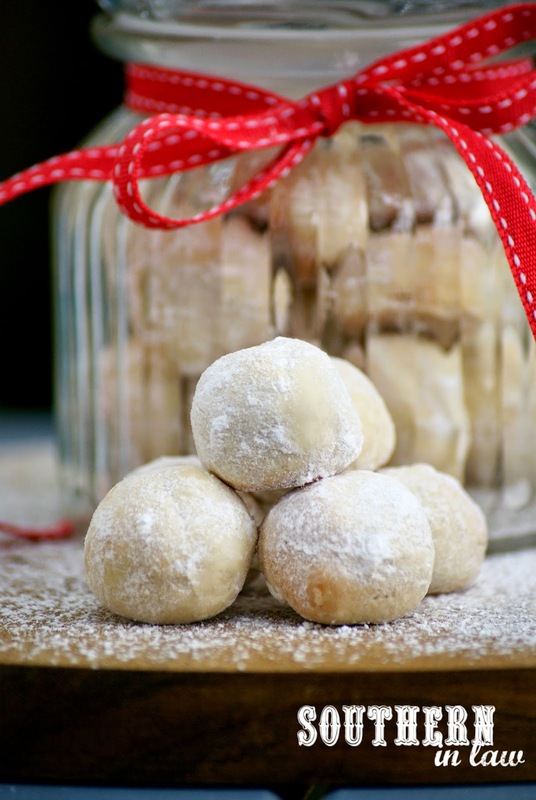 Whilst every single year I make traditional gingerbread cookies and shortbread cookies, this year I wanted to introduce some new some traditions with some delicious new Christmas Cookie Recipes. And in true Southern In-Law Style, I decided to make them healthier too! 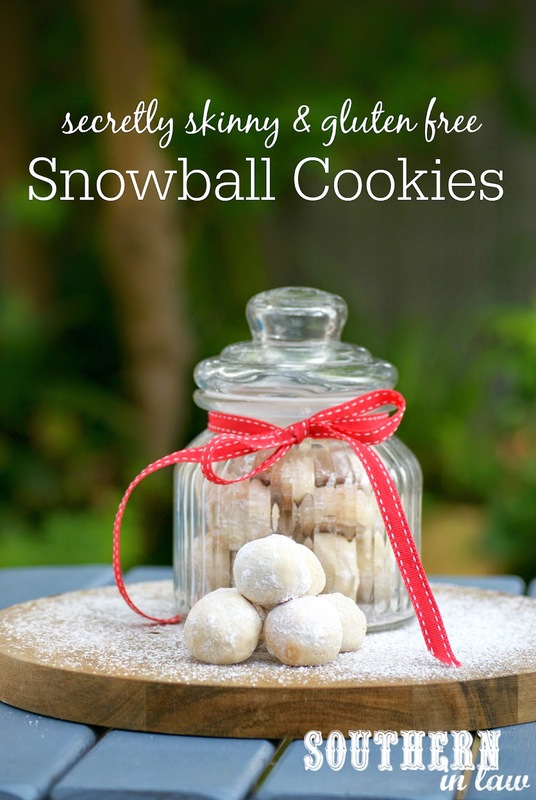 A couple of weeks ago I was sitting in my big red chair of a morning when I said to Jesse "I know what I'm going to make - Snowball Cookies!". "Snowballs? Euggggggggggggh" was the response I got. You see, the type of snowballs Jesse was used to was some type of mushed up cake concoction, covered with frosting and coconut - and that was what he thought I was planning on making. But that was definitely not what I had in mind. What I planned on creating was a melt in your mouth cookie recipe, lightly dusted in powdered sugar to give it a snowball-like look. And what I created was the most ridiculously delicious cookie recipe that disappeared in a day. Even my sister (who is the fussiest of the family) loved them and kept returning to the jar for more. The secret ingredient in these cookies is the cream cheese. They give it an incredible flavour and that melt in your mouth texture. Yummmmmmmmmmmmm-o. 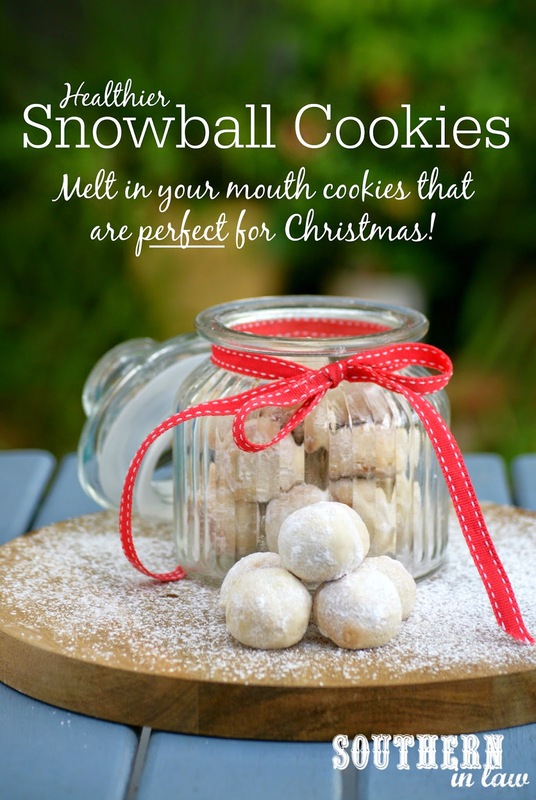 They're the perfect cookie to gift too as they look festive, are easy to make in a big batch and package up nicely in a pretty jar or cookie box. We put ours in this gorgeous jar from The Reject Shop (and only $2! ), tied with a red ribbon. Simple but pretty and ohhhhhhhh so delicious! Line 2x cookie sheets/baking trays with baking paper and set aside. Cream your butter and sugar until light and fluffy, scraping down the sides inbetween beating to ensure everything is incorporated. Add in your cream cheese and vanilla, mixing until smooth. Next add in your flours and mix until combined. Roll your mixture into ~1 inch balls and place onto your baking tray, spacing balls about 1/2 an inch apart. Bake your cookies for 8-10 minutes or until lightly golden and remove from the oven. After rolling in sugar, place back onto a baking tray or platter to cool completely before placing in your jar/in an airtight container. The cookies will keep for 3-4 days in an airtight container at room temperature (if they last that long). The dough can also be frozen prior to cooking and defrosted when ready to bake. But tell me, what's your favourite Christmas Cookie Recipe? I want you to make me gluten-free vegan gingerbread men! It sounds like you and Jesse are thinking of the same thing! It sounds awful so these are definitely nothing like them, haha! These sound so good! And they're gluten-free?! Yep, I will be making these very soon! Is corn flour and corn starch the same thing?